Chemical tanker firm Odfjell said it will not invest in scrubbers to clean fuel on its vessels to comply with new stricter emission rules from 2020 but instead buy fuel which meets the new standards. To combat air pollution, the International Maritime Organization (IMO), the United Nations' shipping agency, has set global regulations to cap the sulphur content in marine fuel, known as bunkers, at 0.5 percent, down from 3.5 percent now. Shipowners can either install scrubbers, which clean the cheaper high sulphur fuel oil, or buy costlier marine gasoil. "Our conclusion for the moment is that it does not make sense for Odfjell (to install scrubbers)," CEO Kristian Moerch said at a oil and offshore conference on Thursday. "First of all our fleet spends around 50 percent of its time in ports, then scrubbers are pointless, and the second part is that 60 percent of our revenues are covered by contracts with our customers and they have bunker adjustment clauses," Moerch said, referring to compensation for any rise in bunker prices. He said he also thought this was the responsibility of the oil industry. "Fundamentally I really don't see why the shipping industry should solve a problem the oil industry have. "Everything comes back to if you believe this spread of $300 (of high sulphur fuel oil vs low sulphur fuel oil) will stay or not," Moerch said. 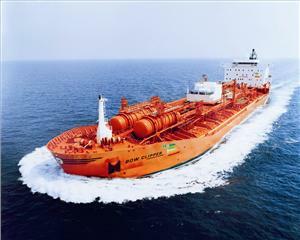 Odfjell owns and operates in total 85 chemical tanker vessels. Whether to install scrubbers or not is a key issue in the shipping industry ahead of new 2020 IMO fuel regulations and Maersk said earlier today that they will invest in scrubbers on some of its vessels.